Jon Vanderpool addressed CTA/NEA San Diego and Imperial Service Center Council attendees at Fall Leadership Conference in Palm Springs, December 1-2, 2018, about Technology, Social Media Pitfalls, Employment Status, Performance Assessments and other Recurring Public School Workplace Issues. Fern M. Steiner has been selected to the 2018 San Diego Super Lawyers list, for the 11th year in a row. Ann Smith hosts raffle during MEA’s General membership Meeting at Balboa Park Club on October 9, 2018. 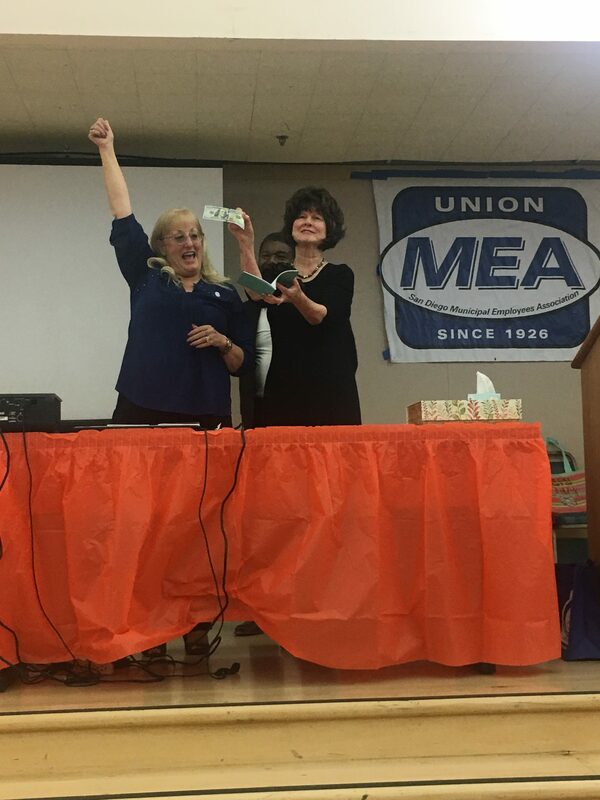 Lucky MEA members were the winners of cash prizes! Jon Vanderpool was guest speaker at the February 2018 Imperial County School Board dinner, addressing ways and means labor and management perpetuate constructive dialogue benefitting the broader community. San Diego Magazine recognizes Ann Smith, Fern Steiner and Jon Vanderpool as Top Lawyers in Labor & Employment. Smith, Steiner, Vanderpool & Wax volunteered at Feeding San Diego, a local food bank which serves over 60,000 local children, families, and seniors in need each week. Our team assisted with “reclamation” projects – checking, sorting, and repackaging quality sweet and savory snacks only rejected by retailers for slightly damaged packaging or decreasing shelf-life. Feeding San Diego can now distribute these valuable snacks to more than 400,000 San Diegans who live in households where food is not always available. SSVW had a great experience and we plan to continue supporting Feeding San Diego’s valuable work in our community. December 2016. San Diego Youth Services recognized Fern M. Steiner for 20 years of dedicated service and support for homeless, abused and at-risk youth. Jon Vanderpool speaks to Encinitas students on Diegueno Middle School’s annual Career Day May 19, 2014, about tools for succeeding on their career journeys ahead. Fern M. Steiner spoke in Palm Desert on strikes and labor law to the California Labor Relations Officers (CALRO), an organization of law enforcement officers who work strikes and labor disputes. Minimum 75% school-year work requirement to attain permanent status must be based on full work days. Teachers cannot apply additional hours worked or round-up partial days. Police officer’s placement on administrative leave after speaking with internal affairs was considered actionable retaliation for exercise of free speech right. In determining whether subject matter of speech is related to employment, Courts must consider the employee’s practical job duties even where different from the job description.